The economy of the United States is in the middle of enjoying the best back-to-back quarters of economic growth since 2014. Following a 4.2% annual growth rate of gross domestic product in the second quarter, we are enjoying a slowing but still strong economic performance in 3Q. The rest of the world, not so much. Following a strongly synchronized global growth story in 2017, the economic fortunes (and market returns) of various regions outside the U.S. have clearly diverged in the first three quarters of the year with many emerging market countries under increasing pressure. The cause is the usual suspect. We are now experiencing the consequence of excessive risk-taking around the globe during this cycle following the financial crisis. The root cause may be the prolonged era where the world’s major central banks have artificially suppressed interest rates to ridiculously low levels (in some cases even negative). It appears the suggested cure for the credit bubble leading to the financial crisis was even more debt with little balance sheet repair. While there remains a legacy narrative of global deleveraging, the reality has been vastly different with the global debt-to-GDP ratio now estimated at 244% from a peak of 210% in 2007 with total debt levels elevated to $177 trillion from $112 trillion (chart below left). 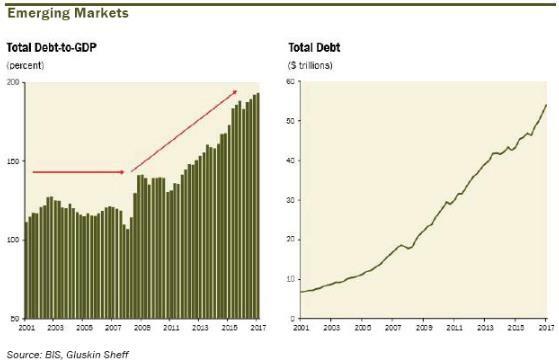 Emerging markets in total (chart above right) gorged at the debt trough with aggregate debt levels climbing to $54 trillion from $17 trillion in 2007. This moved the debt-to-GDP levels from 120% in 2007 to the current 190%. Though emerging markets may be more at risk due to the large amount of debt denominated in foreign currencies, excessive indebtedness is a global phenomenon. 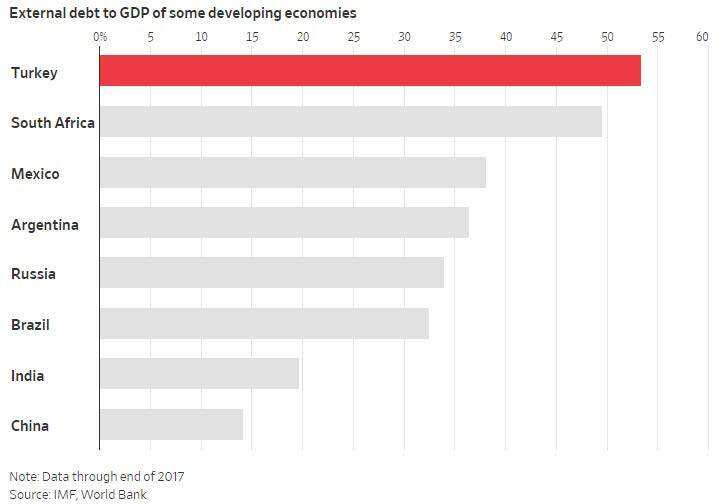 According to a recent McKinsey report, total global debt (defined as the sum of government, corporate and consumer debt) has increased by nearly 75% over the last decade. Most of the increase is in government and corporate debt which have grown from $29 trillion to $60 trillion and $37 trillion to $66 trillion respectively. McKinsey estimates that over 40% of U.S companies are now rated one notch above “junk” or lower with 50% of “investment grade” bonds now rated triple-B (the lowest rating in this category and up from the level of about 30% before the last crisis). Additionally, the Bank for International Settlements estimates 10% of legacy companies in the developed world are “zombies,” meaning earnings before interest and taxes don’t cover interest expenses. Credit quality on a global basis has clearly deteriorated. In the U.S., over 50% of the treasury debt of over $21 trillion will mature and need to be refinanced while almost 45% of the $9 trillion in corporate debt is facing the same needs over only the next four years. 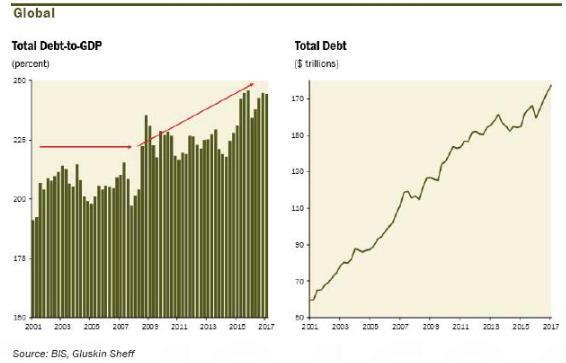 In addition, the process of the Federal Reserve normalizing their balance sheet will require the issuance of an additional $600B in Treasury debt over the coming year. At a time of rising interest rates, the profound increase in supply will challenge demand and likely lead rates, and thus servicing costs, higher. The objective of the fiscal stimulus of the Trump administration is to grow the domestic economy at a faster pace than the growth of debt. The Congressional Budget Office (CBO) estimates the fiscal deficit (the deficit may be viewed as the change in total debt over a period of time) to total 4.6% over the next year rising to 5% over the next few years. If the economy grows more than this, the debt to GDP ratio will moderate, and in this most recent quarter, it did just that rising at an annual rate of 5.4% in nominal terms. Still, these measures threaten to increase the deficit to levels that concern many economists as debt to GDP levels continue to rise. The CBO estimates real GDP growth to average around 1.7% over the next decade with nominal growth of 4.0%. The projected downshift in long term growth is a function of demographics with the aging baby boomer cohort retiring and reducing the rate of growth of the labor force, a critical component of sustainable economic growth. The final revision to 2Q GDP revealed a continued strong pace of economic growth of 4.2% on an annualized basis. Animal spirits have clearly been unleashed on the heels of an administration that has shown itself to be very pro-business. The early consequence of strong efforts at deregulation alongside corporate and individual tax cuts and increased fiscal spending has been a rise in sentiment indicators many of which are at multi-decade highs (charts below from Wells Fargo). Looking at the details of the economy paints a continued sound growth picture into the last quarter of the year. Consistently strong job growth may finally be augmented by rising wages which have buoyed consumer spending following a slow start to the year. Personal consumption grew at 3.8% following a very weak 0.5% pace in 1Q. Business fixed investment has continued to grow (though energy drove half of the upside and is very volatile) while inventory replenishment and government spending have added to overall growth. It should be noted that the 4.2% pace of expansion during the prior quarter is unsustainable and was artificially bolstered by the pulling forward of export growth (specifically soybeans) in advance of tariff concerns. This added over 1.2% to the headline number and will likely be reversed in the soon to be released 3Q report. The slowdown in consumer spending in the major durable areas of housing and autos do give us pause. Confidence is way up and highly correlated to the job market. However, spending has been more focused on experiences and small ticket items. 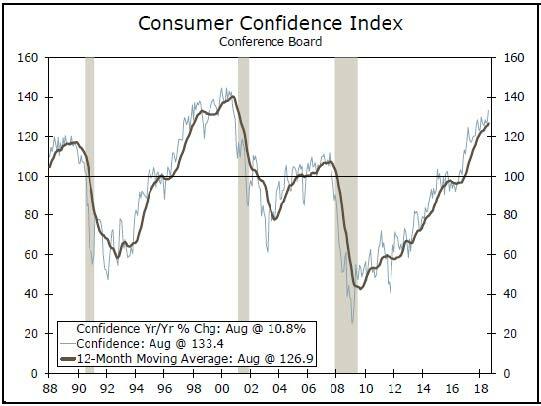 Consumer credit growth, especially in credit cards, has slowed precipitously which is a disconnect with the confidence readings. We have noted the deceleration in auto sales for the better part of two years while the pause in housing is more of a 2018 event. Residential construction has been a detractor from sequential GDP growth in four of the last five quarters and does not seem poised to add much for the balance of the year with most data in this sector disappointing. As we look to the back portion of the year and into 2019, we anticipate a modest slowing in the pace of growth as the early impacts of the tax cut start to fade. Forecasts for economic growth in the late stages of the business cycle are more delicate to predict and continued increases in interest rates by the Federal Reserve add to these uncertainties. As noted, we are a very credit dependent economy and rising interest rates will impact the consumer. We are already witnessing this issue as both the housing and auto markets (the two most interest rate sensitive areas of the U.S. economy) are already softening. For now, the economy remains on solid footing and we are tweaking up our original full year GDP number from a range of 2.5%-2.75% to just short of 3%. Since the financial crisis, we have been in the low inflation camp with our secular view of an aging demography, excess levels of debt and major advances in automation shaping this view. On a cyclical basis, however, we have concerns. Barring a major shift away from the Trump administration’s trade policies (and the recent USMCA deal is a start), we do fear price pressures may soon show up in lots of consumer items. So far, inflationary forces have been mostly held in check with commodity price increases quite moderate in part due to the strong dollar. Oil remains the big exception with prices flirting with $75 per barrel from below $50 this time last year. However, steel prices are up more than 30% since Trump said on March 1 that he planned to impose a 25% tariff on steel imports and a 10% levy on aluminum. As steel prices rise, it makes major appliances, machinery, trucks and cars, and construction more expensive. Aluminum is in everything from transportation to packaging to cooking utensils. When steel and aluminum prices rise, so too do the prices of refrigerators, dishwashers, stoves and other appliances. These are potentially significant increases that have yet to flow through to consumers. August consumer price inflation came in a bit softer than markets were expecting, with headline CPI increasing 0.2% and the core advancing 0.1% lowering the year-over-year increases to 2.7% and 2.2% respectively (see chart below from Wells Fargo). 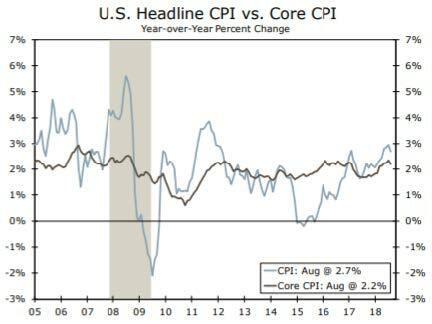 The modest gain in core inflation comes on the heels of a strong print for July (0.24% before rounding) and does not alter our view that the underlying trend in inflation remains modestly upward given rising input costs, including labor. The pause we have seen is more reflective of the base effect whereby the numbers from one year ago had already started to rise thus lowering the annual increases. In many ways, the current inflation environment is just what the Fed wants to see. Core inflation has slowly moved back up to levels consistent with the FOMC’s target with few signs of inflation blowing far past the Fed’s comfort zone and forcing the Fed to raise rates faster than expected. Tariffs, of course, remain the wild card. Following the eighth increase in the Federal Funds rate in late September to a range of 2%-2.25%, Federal Reserve Chairman Jay Powell and the FOMC appear resolute in their objective of slowly normalizing interest rates with the balance of the committee clearly moving in sync. In a September 12th speech, Fed governor Lael Brainard, who last year advocated for caution in raising rates, said the Fed likely would want to bring rates higher than the long-run neutral level that would neither spur nor slow growth. Brainard thus becomes the third top Fed official (along with Chicago Fed President Charles Evans and Boston Fed President Eric Rosengran) to move from the dovish to the hawkish camp in recent years, and the second to cite the economic stimulus provided by the tax cuts and spending increase as a reason for doing so. The Federal Reserve will continue to lean against elevating inflation readings, thus undercutting much of the benefit of the fiscal stimulus. The Federal Reserve does have the comfort knowing there is an absence of a significant systemic concentration of investment in housing or related financial imbalances which have often triggered or amplified downturns in the past. As we have noted above, there remain supply side trends such as an aging demography along with accelerating technological innovation that lower inflation risks and allow the Fed to move with caution. Interest rate increases by the Fed are not the only issue the markets will be digesting. Liquidity is being quickly drained from the financial system and the growth rate of money supply as noted in the M1 and M2 figures has softened to near 1% over the last year. The major central banks are reducing their balance sheets with the $420B unwinding from the Federal Reserve in 2018 being increased from $35B to $50B per month ($600B annually) starting October 1. With the ECB curtailing its QE to a negligible amount of €15B per month from €30B (peaked at €80B last year), the Bank of England increasing rates and the Bank of Japan increasing the yield curve strategy, the global monetary base is contracting for the first time in five years. This impacts the world economy with a lag. The job market continues to expand at a pace that many of us did not expect in 2018. Job openings (as reported by the Jobs Openings and Labor Turnover Survey-JOLTS) sit at record highs as does the employment index in the ISM non-manufacturing survey. Jobless claims continue to plumb historic lows indicating firms are hanging on to workers given the difficulty in finding new hires. Despite an expected slowing from the hiring pace of the last few years as the economic cycle enters the latter stages, the 3-month average of job gains following the release of the September nonfarm payroll report is 190K per month. This compares very favorably to the 6-month average of 203K and the full year averages for 2017 and 2016 of 171K and 195K per month, respectively. Over the last year, the growth in the available labor force (along with productivity gains, a critical input into sustainable economic growth) has slowed to 0.52%. 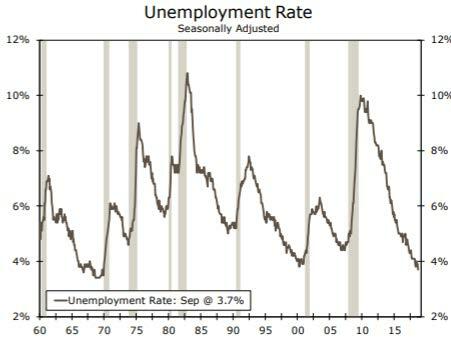 Yet the growth in employment has been 1.06% thus moving the unemployment rate to 3.7% (chart from Wells Fargo on next page) as of the September payroll report. This is a level last broached in 1969 when Joe Namath and the New York Jets were defending Super Bowl champions, a reality so confusing on many levels. Despite such strong job gains, we do find some pockets of concern. We are running out of workers. The pool of available workers is shrinking quickly and now stands at less than 11.2M people. This is great news and is all a consequence of the economy continuing to expand above potential. However, this also means the quality of the new hires is diminishing. Unemployment rates for skilled and educated college graduates has declined to 2.0% leaving businesses to turn to less qualified workers to fill record openings. Over the last five payroll reports fully 100% of the job gains have been filled by those with a high school diploma or less. The unemployment rate for those with less than a high school diploma has dropped over the last year from 6.7% to 5.5%. For those with only a high school diploma, the rate has declined from 4.3% to a historic low of 3.7%. While this is great news for the labor force, I am not sure what it may imply about productivity and future sustainable growth. 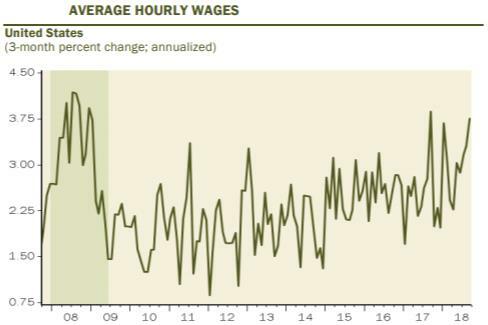 As the job market continues to tighten, we are seeing discernable and accelerating wage growth that we still feel is understated by the averages. Though average hourly earnings are only up 2.8% over the last 12 months, a pace far below that registered in previous cycles, the acceleration in wage gains is pronounced. The annualized wage gains over the last three months are up to 3.8% on an annualized basis (see chart below from Gluskin Sheff). Despite these increases, we feel the core wage growth may be understated by the aggregate. As virtually all of the new hires are under the age of 25 and with no college degree, the wages commanded are less. Additionally, with the continued exodus of higher paid baby boomers from the labor force, the impact on the aggregate is to suppress the average wage. Make no mistake, employees continue to get a larger piece of the profit pie. Perhaps the biggest challenge in extending the economic cycle will come from the lack of available workers. Despite the tight labor force, the prime age employment population ratio (25-54-year-old cohort) remains nearly 1.5% below the two-decade average. 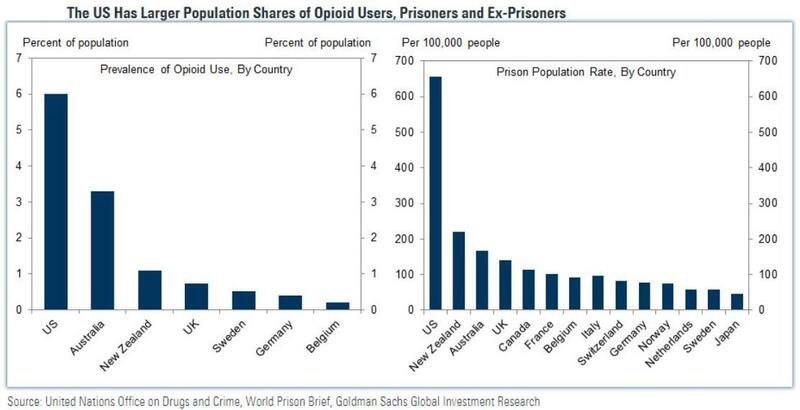 The U.S. labor force participation rate is distinctly worse than other advanced economies with most of the issue explained by far higher rates of incarceration and opioid use (see chart from Goldman Sachs below). An analysis by the conservative-leaning think tank American Action Forum found that the loss of those workers slowed U.S. economic growth by 0.6% annually. This is both a human and economic tragedy. Is the U.S. consumer in better shape than previously thought? A comprehensive benchmark revision to the National Income and Product Accounts (NIPA) in late July dramatically revised data going back five years suggesting the U.S. consumer has been saving a much greater percentage of their disposable income than had been previously estimated. The chart below (from Farr, Miller and Washington) shows the revisions to the saving rate which include, for example, 2016 and 2017 that are now pegged at an average 6.7%, up from a previously reported 4.2% with the most recent savings rate of 3.3% for the 1Q 2018 period now reported at 7.2%. Why would this be important? 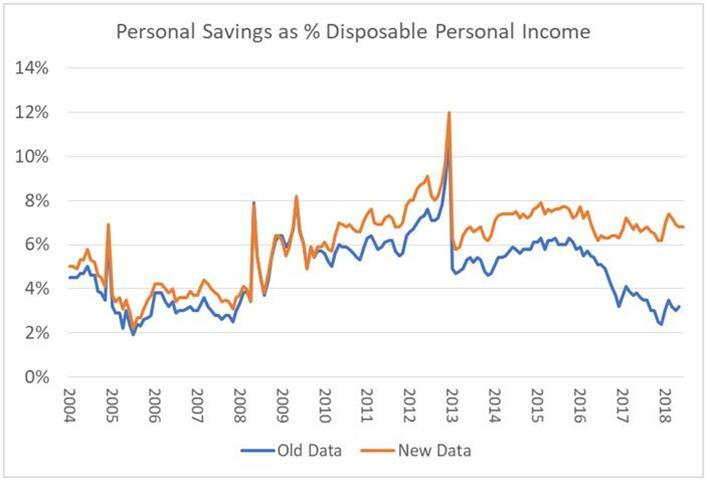 With consumer spending representing more than 67% of the total U.S. gross domestic output, higher savings rates might indicate the ability of the consumer to spend and withstand a downturn is far greater than had been understood. However, as this data is aggregate data it is important to decompose the revisions in the context of how this might impact consumer spending. Most of the revision to savings in recent years (about 70%) came about because of adjustments to calculations of proprietors’ income (income from small businesses that are not incorporated) that differ under the new tax law and upward revisions to property income (rents, income and dividends). It did not result from larger wage increases as employee compensation was only modestly revised higher. Ownership of small businesses and financial assets that were the source of the revisions are generally found in the top quintile of income brackets. Work by Ned Davis Research shows that the top quintile of income earners spends only 56% of their total compensation. This compares to the bottom two quintiles that spend fully 126% and 221% of their totals. This lower marginal propensity to consume for the primary beneficiaries of this revision indicates the impact on consumer spending should be muted but is nonetheless a positive development overall. More positive data for the middle class was noted in the release by the U.S. census in September showing the highest recorded levels of household income. The median U.S. household earned $61,372 last year, meaning half of the families in the country brought in more income than that figure and half earned less. The data shows that median household incomes rose 1.8% in 2017 and have averaged 2.0% per year growth over the last five years, more than 2x their pre-crisis trend of 0.73% year. 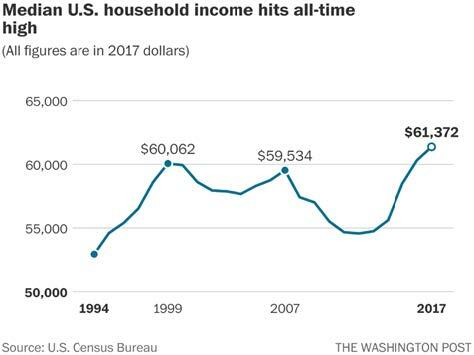 Crossing the $61,000 level is a sobering but welcome milestone as it signals that the American middle-class may have finally earned more than it did in 1999, the previous peak adjusting for inflation. Though wage growth has been sluggish, many Americans are compensating for that by working longer hours, holding multiple jobs or having another family member find employment. No matter, incomes are rising, and jobs are plentiful. 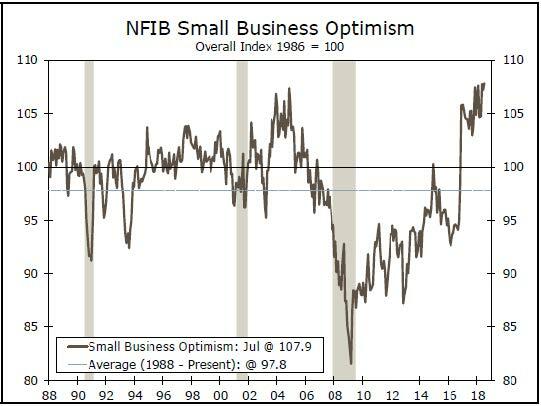 Consumer and small business confidence levels reflect these developments and stand at multi-decade highs. With the recent acceleration in overall economic growth, expectations for the housing market were approaching ebullience heading into the peak selling seasons in spring and summer. That enthusiasm has been tempered with the sales of existing homes changing hands at the slowest pace since September and new home sales having fallen to the lowest level since October 2017. The disconnect between a strengthening economy and struggling housing sector has been a common theme throughout this expansion and, unfortunately, is a theme that is likely to continue. America remains mired in by far the weakest housing market of the postwar era. 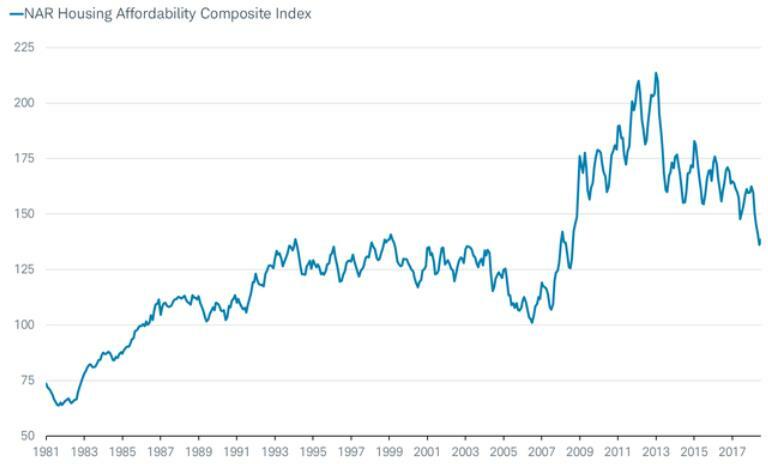 New housing starts over the last 12 months weigh in at a seasonally adjusted annual rate of 1.2 million (chart from Charles Schwab on next page). That’s barely half of where it stood at the peak of the last business cycle. 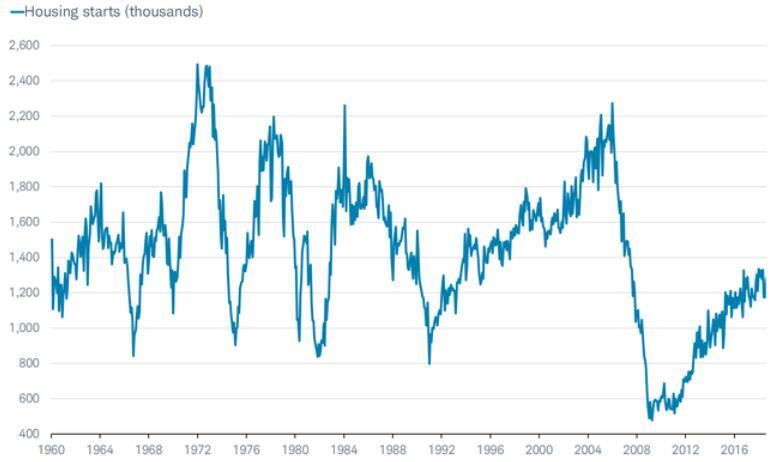 And, in fact, it is lower than at the peak of any business cycle going back almost all the way to World War II. Historical data on the U.S. housing stock reveal that even the America of the 1950s out built the America of the 2010s. What makes this trend truly remarkable is that America today has a much larger population than in earlier decades. In 1972, for example, America built twice as many houses—even though our adult population back then was only 57% as large as it is today. We have noted over much of the economic recovery the paucity of inventory available on the market and the headwinds this has created for recovery. While remaining less positive on housing growth than consensus, we still felt that the demand side of increasing job growth, rising wages and pent-up demand (especially from the millennial generation) would continue to lead to further gains in the market. Though inventory is now improving, we feel that housing is unlikely to make a major breakout to the upside at this late stage of the business cycle. After declining on a year-over-year basis for 39 months, inventories now stand 2.7% higher in August than they did last year with inventories of single-family homes up over 3%. Even with this improvement, they remain well below the levels of three years prior and of long-term averages and much of the damage of low inventories remains in the market. 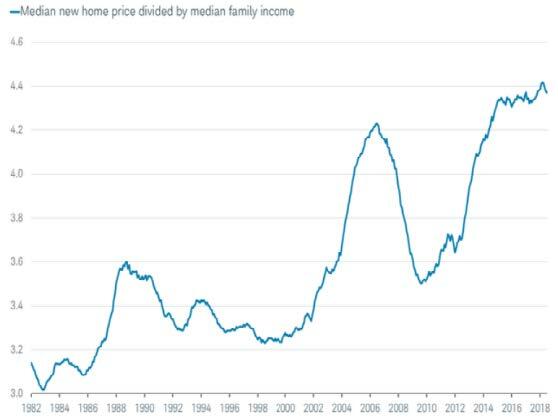 Following years of housing prices increasing at levels twice the rate of income growth, affordability is now at decade lows (charts from Charles Schwab below). Using another metric for housing prices that compares only the median new home price to the median family income (excluding the impact of still low mortgage rates), indicates that housing prices are at historic levels. With home prices at or near record highs, it takes more than a small boost to income to change the calculus on affordability especially with the Federal Reserve continuing the path of raising interest rates an estimated four to six more times in this cycle. Under these projections, mortgage rates might increase by at least another half of one percent from current levels that have already impacted the market in dramatic ways. For illustration, imagine a young couple looking to buy the median price house of around $267K only two years ago at the then prevailing conventional mortgage rate of about 3.5%. With a 20% down payment the cost of servicing the mortgage (excluding taxes) would have been about $959 per month. With housing prices increasing about 6% annually during the recovery, the same house would now be worth around $300K. The current mortgage rate of about 4.75% on the same loan would mean the cost to now finance an 80% loan to value mortgage would be $1,252 per month, an increase of over 30%. Residential construction spending is now growing at only 6.7% over the last year, the slowest pace since 2012. Residential investment spending consists of the value added from new home construction, home improvements and the sales (brokerage commissions) of existing homes and feeds into the GDP calculation. 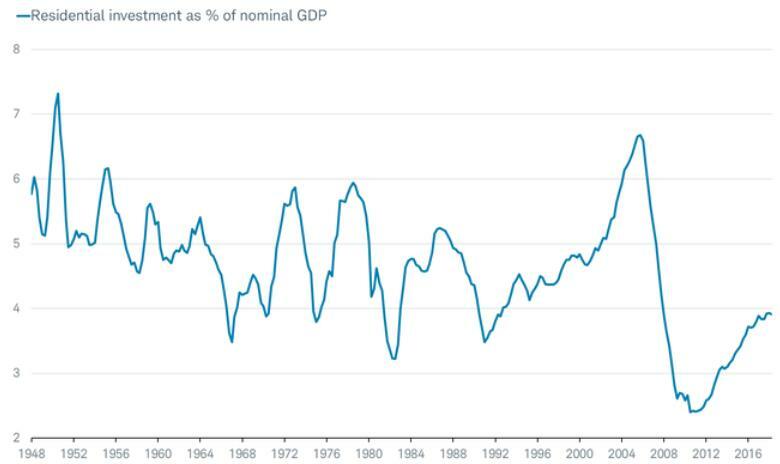 As a share of GDP, residential investment is currently up to 3.9% from a record trough of 2.4% at the end of the housing bust in 2010 (chart below from Charles Schwab). Though this metric peaked at 6.7% during the housing bubble, the historical average is 4.6% indicating that, perhaps, this cycle has a ways to run. Though we believe the economic cycle still has legs before the next recession, it is unlikely that this metric will reach historical levels despite strong support from job and wage growth. Given that the housing market has often been a leading indicator around inflection points in the economy, we will be watching closely for signs in housing that would better indicate whether this recent period represents a long term or just cyclical slowing. Thanks in part to the fiscal stimulus from tax cuts and greater government spending, the U.S. economy has enjoyed a marked acceleration in economic growth in 2018. The concert that was synchronized global growth in 2017, however, has turned into an acapella performance with many of the world’s other major economies, such as the Eurozone, United Kingdom, Japan, Canada and China thus far growing at a slower pace this year relative to last. Though central bankers in Europe and Japan are modestly reducing policy accommodation, we still look more for a leveling from growth over the next few quarters rather than a pronounced downturn. The largest risk to this forecast, of course, remains an escalating trade war and a spiraling debt crisis emerging again in Italy. The recent updating of the 24-year old NAFTA agreement with the United States-Mexico-Canada Agreement (USMCA) has increased our optimism that a full-fledged trade war will not occur with our close allies. The administration has recently moved away from a spat with our allies in Europe and we would be better served in forming a trading bloc and a unified front. An agreement with China remains elusive, however, and is a tail risk to the global outlook. 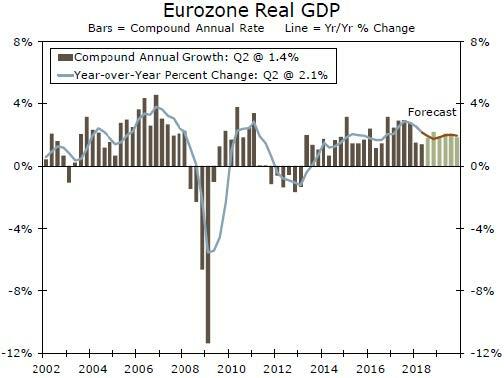 Though slowing from a strong 2017, the rate of economic growth in the Eurozone was a still above trend 1.4% annualized rate (a/r) in 2Q bringing the year-over-year GDP gains to 2.1% (chart from Wells Fargo below left on next page). Still, the ECB downgraded its economic forecasts slightly for 2018 and 2019, with European Central Bank (ECB) President Draghi citing a weaker contribution to GDP growth from external demand. While the economic expansion appears generally intact through 2019, trade tensions remain on the forefront of economic concerns. President Draghi cited rising protectionism as a risk to its outlook, a factor that that could also weigh on export growth in coming quarters. 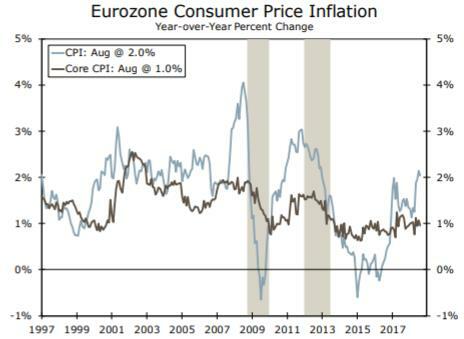 Eurozone inflation has been stubbornly low for over five years, which has prompted unprecedented amounts of monetary easing from the European Central Bank (ECB). The CPI inflation figures for August (chart from Wells Fargo above right) edged back down to 2.0% still in line with multi-year highs but the core rate slowed back to 1% on an annual basis. Several global supply cost factors including lower commodity prices have played a role in the frustratingly sluggish inflation readings but there are signs this may be changing. 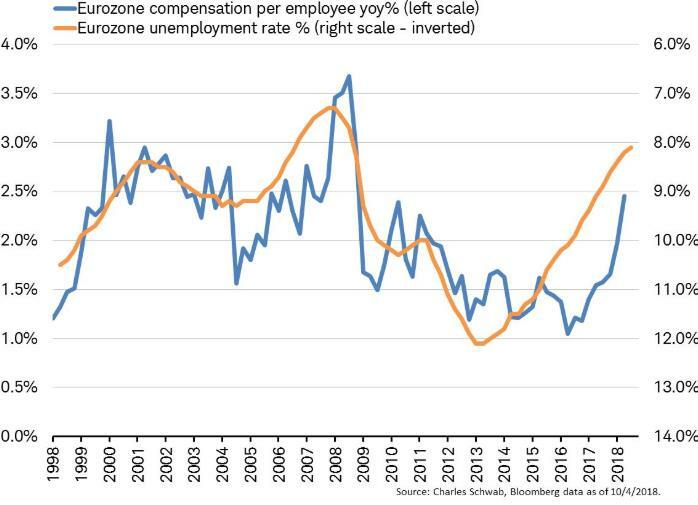 Indeed, data released this week showed that with unemployment moving back to pre-crisis levels, wage growth reached 2.5% year-over-year in August, a dramatic jump from the near 1% level as recently as 2016 (chart below). While core inflation remains stuck around 1%, the 2Q pickup in compensation is a positive sign for rising price pressures going forward as wage growth picks up and real consumer spending power increases. These recent trends support the European Central Bank’s current plan to taper asset purchases from €30B to €15B per month in October before wrapping up its bond-buying program at the end of 2018. The current plan remains to also initiate interest rate hikes starting in the second half of next year. Following years of accommodative monetary policy, The ECB, like the U.S., is also removing liquidity from the monetary system. Will the ECB be able to continue this stated pace as Italy continues to threaten to add to its already record debt pile? With a debt-to-GDP level already more than 133% (more than any other Eurozone country except for Greece), Italy and the European Union will need to come to a coordinated plan to reduce the Italian debt burden in the years ahead or fears of contagion may re-emerge. Unlike most other central banks, the People’s Bank of China (PBOC) has been guiding interest rates lower, due largely to concerns over recent signs of slower growth and worries about further deceleration going forward as GDP growth has downshifted to a 6.7% a/r in the most recent quarter. More to the point as noted in the opening section, China has been the poster child for increasing levels of indebtedness. Corporate debt now stands at 156% of GDP and total debt-to-GDP is approaching 300% driven by the growth in household debt. Any interest-rate increase would raise debt-servicing costs substantially and place enormous pressure on Chinese firms and households that have been the backbone of economic growth. But an escalating trade war with the United States may be the greatest concern and may already be weighing on the Chinese economy. China engages in a wide range of unfair trade practices that distort global trade. While the focus is often on the tariffs that China places on the U.S. and other country imports, they don’t form the majority of China’s unfair trade practices. China is not a free market and most of the largest companies in the country are state-owned. The Chinese government subsidizes its industries in many non-free market ways from the granting of cheap loans from state-owned banks to energy and export subsidies. Lax environmental regulations along with weak labor standards and worker rights keep labor costs down and deflect competition. These issues do not even include the intellectual property theft which, at one time, could be viewed as a positive in allowing China to catch up technologically and pull hundreds of millions of people out of poverty but is now simply bloodsucking. Over the past three decades, trade between China and the United States has skyrocketed. Last year, the value of Chinese exports to the United States ($505B) exceeded the value of American exports to China ($130B) by $375B. It is this dramatic widening in the bilateral trade deficit that has provoked the ire of the Trump administration. The $505B of exports to the U.S. from China are equivalent to roughly 4% of Chinese GDP. Though the gross amount of exports may overstate the economic exposure that China has to the United States (much of the total includes items imported and then assembled in China), it is still significant. 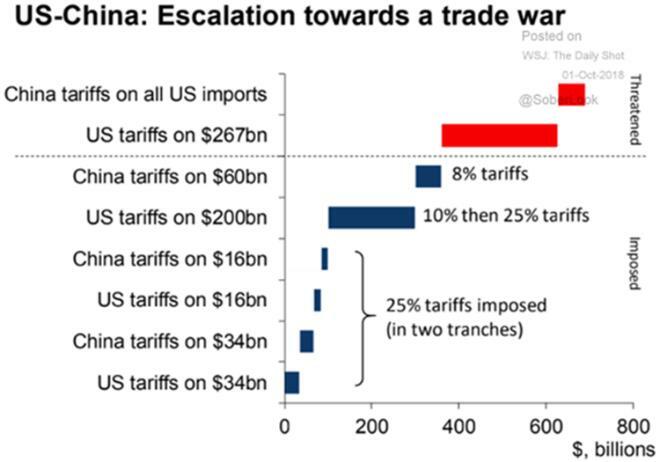 As the chart below shows, the U.S. has already imposed tariffs of 25% on $50B of exports alongside the just enacted 10% on an additional $200B of goods that rises to 25% in 2019. Additionally, the administration has threatened that should China retaliate, we would impose tariffs on $267B of remaining exports. With manufacturing accounting for 30% of China’s economic output, reduced demand for Chinese goods due to rising costs of tariffs could have a notable impact on gross domestic product estimated around 0.5%-0.6%. Though the Chinese government has the levers to continue to stimulate the economy and the hit to exports from the U.S. tariffs would not be enough to move the $12T Chinese economy into recession, the collateral impact on the global economy would be pronounced. Still, what most likely keeps General Secretary Xi Jinping up at night is a potential coordinated effort and assault by the U.S., EU and Japan (TPP anyone?). In recent months the EU and Japan have joined forces with the U.S. in World Trade Organization (WTO) complaints against “forced technology transfers” in China through mandatory joint venture structures with local partners. If the primary concern of the U.S. is trade with China, the initiation of trade actions against the EU, Canada, Mexico, Japan and South Korea is a scattergun approach that reduces the strength that a coordinated effort would provide in isolating China. With recent positive talks with the EU alongside an agreement with Canada and Mexico to update NAFTA, a more effective trade strategy may be on the horizon. With Prime Minister Shinzo Abe having recently been re-elected to a third consecutive three-year term as head of the Liberal Democratic Party, Japan will continue to pursue recent initiatives which have helped the pace of economic activity move to two-year highs alongside visible signs of accelerating capex growth. Business investment has been an elusive goal throughout most of the current cycle partly because even though Japanese businesses report strong profits, there has been only modest willingness to put that capital to use. That may be changing. After six straight quarters in which firms have only gradually increased spending, business investment grew at a 5.2% a/r, the fastest pace since 4Q 2016. The reform initiatives of the Abe leadership have also helped expand the work force after years of contraction and more than 70% of Japanese women with children are now in the labor force compared with 56% in 2004. 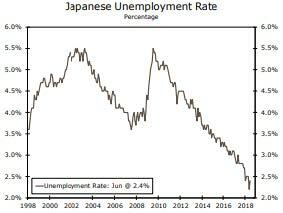 This expanding job market has moved the unemployment rate in Japan to 2.4%, the lowest level since the mid-70s (chart from Wells Fargo below left). The tight labor market is at last compelling businesses to do what years of pleading from policymakers could not: it is making them pay people more. Average monthly cash earnings, which have been stuck in neutral for years, are finally picking up. The year-over-year growth rate of monthly cash earnings (includes base pay and bonuses) is up 3.6%. 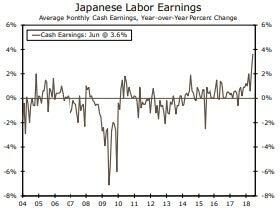 Workers in Japan have only rarely seen earnings growth of more than 2% in the past 20 years and the 3.6% increases for June is the fastest pace of growth in earnings since 1997 (chart from Wells Fargo below right). Overall, the economy grew at an annual rate of 3.0% in the April-June quarter, the fastest pace in more than two years and much faster than initially reported thanks to an upswing in capital expenditure. The upward revision from a previously reported 1.9% expansion confirmed the world’s third-largest economy had rebounded from a temporary slowdown in the previous quarter following two years of continuous expansion, which had been the longest stretch of uninterrupted growth in 28 years. This rate of growth is the fastest since 1Q 2016 and has corresponded with companies stepping up investment in factories and equipment after enjoying record earnings in recent years. This is partly in response to meet robust demand from overseas, and in connection with a construction boom at home ahead of the 2020 Tokyo Olympics. Much as with Thailand in 1997, the epicenter of the consequences of the growth of global debt since the financial crisis may be found in Turkey. Turkey’s escalating crisis is spotlighting the giant stockpile of foreign-currency debt held by emerging markets, a build-up that threatens to throw those economies off course in the coming years. Turkey is the EU’s 5th largest trade market so the economic downturn presents a risk of exerting a negative feedback loop. Turkey has been a huge borrower in the last few years when global central banks encouraged investors to stretch for yield. Here the consequences of global interest rate policy are vividly on display as over half of Turkey’s borrowing is denominated in foreign currencies (primarily U.S. dollars) not the lira. When the lira (or any local currency) sinks, debt-servicing costs and default risks rise in a pronounced way. But even outside Turkey, emerging markets have grown their foreign-currency debt sharply in recent years (chart below) as they took advantage of low rates that made borrowing cheaper and lifted demand for risky assets like the bonds of developing economies. According to Deutsche Bank, Hungary, Argentina, Poland and Chile all join Turkey in having foreign-currency denominated debt that stands at more than half of gross domestic product. For now, there’s little evidence that all emerging-market currencies will be hit with the same ferocity as Turkey, where recent troubles have been sparked by its unique economic policies and questions about the government’s willingness to quell the crisis. Though we acknowledge the continued strong dollar increases the risk of a bad outcome, we are more sanguine on the prospects for emerging economies as a whole. Many developing economies are better equipped to deal with their external debt loads than they were 20 years ago. Firstly, most developing economies allow their currencies to float at present, rather than maintain fixed exchange rates, as they did heading into the financial crises of 1997-1998. The impact of that is that central banks can now allow the exchange rate to adjust gradually downward without the immediate need to raise interest rates to defend their currencies as they would under fixed exchange rate regimes. The floating currencies in turn reduce the need for large foreign exchange reserves to potentially defend their currencies. 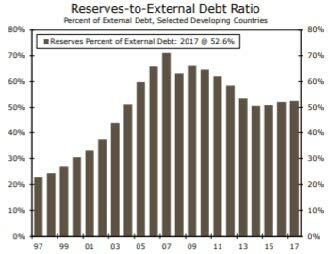 However, reserves of the 19 largest developing economies excluding China as a percent of external debt stand at 53% today, more than twice as high as it was twenty years ago (chart at the top of following page from Wells Fargo). 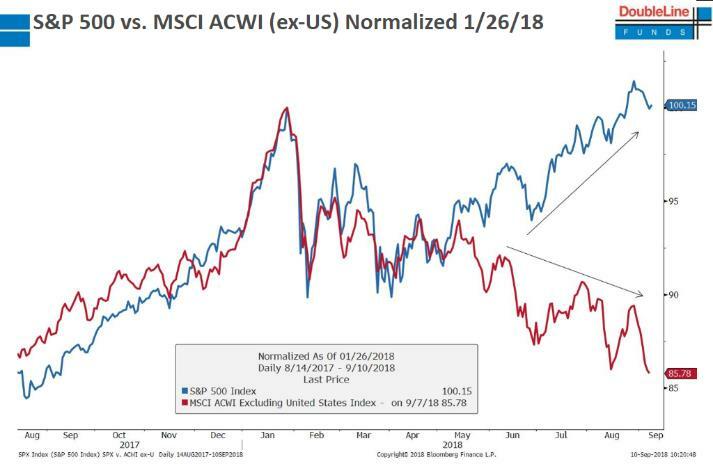 Following the late January decline of 10% in the major averages, the U.S. equity markets have come roaring back and diverged dramatically from markets outside the United States (see chart below). A rising U.S. dollar along with reduced global policy accommodation and increasing interest rates have combined with heightened trade tensions to broadly impact international markets. This contrasts sharply with a U.S. market that has been energized by tax cuts, fiscal stimulus and the flight to safety from market volatility in the rest of the globe. Though we remain concerned economically about the potential impacts of a continued escalation in trade wars, the reaction and concern of the domestic financial markets to such political and geopolitical developments have long been overexaggerated. Markets ended 3Q near peak levels with the economy continuing to accelerate and corporate earnings growth attempting a third consecutive quarter of 20% or greater earnings growth. With massive deregulation and large corporate tax cuts continuing to provide a strong tailwind for corporate America, the recent trajectory has continued into the final quarter of the year though may soon face increasing challenges. Earnings comparisons will begin to get more difficult over the next few quarters as we anniversary the impacts on earnings of the major tax cut and therefore, we should expect a slowing in the growth rate. Aside from the high hurdles of the last few earnings periods, rising labor and input costs along with the stronger dollar and rising interest rates may all present additional headwinds to earnings growth. The U.S. dollar is up almost 7% since the late January trough coinciding with the early 2018 correction. A rising currency reduces the value of international revenues and acts with a lag of generally two to three quarters. 2017 was marked by a strong decline in the currency of about 12% for the full year and that benefit to corporate earnings may now be reversing. With almost 44% of the S&P 500 revenues derived internationally, the impact is not trivial. Additionally, higher input costs due to supply chain disruptions, increasing tariffs and rising labor costs and interest rates threaten to crimp corporate margins. While corporate America has continued to mine new and higher profit margin levels throughout this expansion, the next few quarters may represent increasing hurdles. The S&P 500 enjoyed a strong advance during the recently completed 3Q performing the best of the respective indices with a 7.7% total return and bringing the full year gain to 10.6%. The powerful divergence between growth and value continued during this period with the Russell 1000 Growth index now exhibiting a full year return of 17.1% compared with the modest Russell 1000 Value index return of 3.9%. Small capitalization companies lagged slightly during the quarter but still represent the best performing asset class in 2018 with a 11.5% gain. Returns outside the U.S. have not been generous as noted above. Through the first three quarters of the year, the MSCI EAFE index of developed countries has a modestly negative return of -1.4% that clouds the decline of almost -12% since the late January peak. For the MSCI Emerging Market index, the results are increasingly negative, down -7.7% through 3Q but in a bear market of -21% since that period. Interest rates as measured by the 10-year U.S. Treasury bond have risen almost a full percentage point over the last year rising from 2.43% entering 2018 to the close on September 30th of 3.05% and elevating further in early October towards 3.25%. This rise in rates has clearly pressured returns on high grade fixed income with the long government index off -5.8% and the Barclays U.S. Aggregate index off -1.6% for the year. The credit area represented by lower quality high yield bonds has fared better, returning a positive 2.6% but concern us a being, perhaps, the most overvalued area of the capital markets. 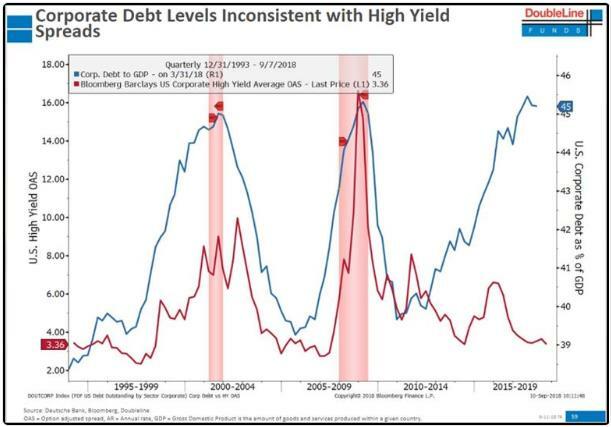 As the chart below depicts, corporate debt to GDP (blue line in chart) is at extreme levels, yet high yield spreads to riskless treasury yields are near all-time lows, indicating investor complacency. Investors in this area are not being compensated for the risk, and the movement of these credit spreads is often an early indicator of increasing stress in the markets. For now, they are not flashing yellow but this is an area to be closely monitored. As the Federal Reserve and many global central banks have continued the process of withdrawing policy accommodation from the markets at a time of escalating geopolitical tensions, it is logical that market volatility increases. At Coho Partners our focus remains on downside protection. We seek to provide this from the construction of a differentiated portfolio populated with high quality companies with resilient earnings streams, growing dividends, strong balance sheets and reasonable levels of expectations and valuations. With financial markets by most metrics at elevated levels, we feel this philosophy is very well suited to address the challenges facing investors.